Nathan Lee Xuereb during the Green Cup competition in Perugia. 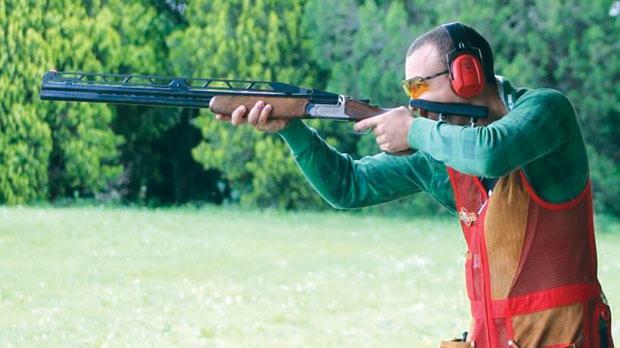 Young Maltese shooter Nathan Lee Xuereb added another feather to his cap on Sunday after producing top form to win the 2013 Green Cup, the Italian national championship which doubles as an international event. In fact, 66 Double Trap marksmen, hailing from various other countries outside Italy, com-peted in the shoot at the Umbria Verde ranges in Todi, Perugia. The championships were hosted by the Italian shooting organisation and held under the auspices of the International Shooting Sport Fede-ration. Xuereb started with a modest round of 24 from 30 but improved to 27 in his next showing and repeated that score again in the third round. Under the watchful eyes of his coach Jimmy Bugeja, Xuereb only missed one clay in the fourth round before slipping back to 27 in his final round of the competition. Xuereb qualified for the semi-finals in second place with a total of 134 from a possible 150. In the semi-finals, Xuereb managed 27/30 to book his place in the gold and silver medal match where he improved his score to 28, enough for him to claim the title. The result was a boost for Xuereb after his below-par performance at the ISSF World Cup shoot in the United Arab Emirates last month where he missed out on a medal shoot-off after a qualifying round of 130 clays. Meanwhile, Italian shooters were particularly keen to score high in the Green Cup last weekend with technical director Mirco Cenci taking stock of the country’s best talent before announcing his selections for this summer’s ISSF World Cup (Granada), the World University Games in Kazan (Russia) and the International Shotgun Cup in Suhl (Germany). Trophies on Sunday were pre-sented to the winners by Italian clay shooting federation (FITAV) head Luciano Rossi.